Coryn has always had favorite books and I've always enjoyed reading to her. She is, however, a restless kid and doesn't like to sit still for long periods of time. She finds ways to make story books interactive. Her newest thing is to say she's going to read it "with me." What this means is she repeats everything I say and if it is too much to repeat she just makes a droning noise the same rhythm of my words. It drives me nuts. Maybe it is something I should just put up with, but lately, I've been refusing to read unless she stops. It's about 50/50 whether she stops or just decides she doesn't want to listen to books if she can't hum over everything I'm saying. About a week ago, however, when she didn't want to take a bath, I told her if she didn't plants would start growing out of the dirt on her skin. 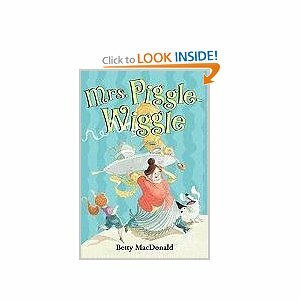 I remembered this from a story I'd read when I was younger (old enough to read to myself but not by much, so maybe 8 or so), part of the Mrs. Piggle-Wiggle books by Betty MacDonald. I gave her the cliff notes version of the tale during her bath and she said, "I want to read that book tonight." Unfortunately, it's not in my collection. . .or I should say it wasn't in my collection because that next day I had to order something from amazon and needed one more small item to get to the magical $25 and above Free Shipping (Amazon has probably gotten me to buy a couple of thousand dollars more of merchandise over the years because of this free shipping scam. . .well, it's not really a scam because it's not a deception or anything, it's just every time I order something it seems like I'm tacking on something else so that my item adds up to at least $25). Mrs. Piggle-Wiggle made it into my shopping cart and yesterday it came in the mail. .
Coryn loves it. We sat through the first three chapters before she started to get restless again. She does ask a lot of questions and since there is only one picture per chapter, when we do get to that picture, she snatches the book, stares at it for several minutes, and asks me probing questions about what they are doing in the picture (often ones that would have been answered if she'd just let me keep reading. .. sometimes I can get away with saying, "wait and see."). If you aren't familiar with these books (which are awesome), the premise is a clever (or in later books magical, in the earliest stories she uses more tricks, reverse psychology, and common sense and nothing I'd really consider "magic" but in later stories she gains some mild, fairy-god-mother-esque powers) woman who loves children and makes her remarkable house open to them all the while helping their mothers cure bad behavior with never fail "cures." Mostly these cures involve giving a child too much of something they think they want until they are sick of it. The boy who won't pick up his own toys is left to his own devices until he literally becomes trapped in the room by the out of control mess. The girl who talks back is given a parrot that parrots everything she says until she realizes how nasty and rude she is sounding. I'm not sure Coryn always gets how this actually works. She's still at the stage where the idea of getting her way to an extreme is appealing. . . She used to think "too much" was a good thing because I'd tell her she's eating too much candy or watching too much tv and she'd literally ask me, "Mommy, can I have too much candy?" or something to that effect. She's stopped using this particular phrase but I think the thought process still applies. Coryn is pretty quick to compare herself to the kids in the books, pointing out that she cleans her room, and when we got to the story about the boy who wouldn't share, she became practically indignant. "I share my toys!" she said firmly. I should preface this by saying, we do use corporal punishment. I find spanking to be a reliable and non-abusive form of punishment and I actually find most non-physical forms of punishment to be more damaging in the long run. We only spank for serious offenses or complete control loss tantrums (time outs or a talking too also work well with Coryn because she is one of those kids who likes to know she's a good girl and sometimes simply telling her behavior is bad is enough to zap her back on track), but sometimes it seems like her behavior will just slowly get worse and worse as she gets away with little things over the day and it takes a swat on the behind to "reset" her behavior. Anyway, the story of the little boy progressed until he was given some candy to share with all his kids but instead just showed it to kids and told them he'd hit them with a baseball bat if they touched it. This made Coryn livid and she immediately demanded that he get a spanking. We actually stopped reading in the middle of this chapter because she was so convinced that the only thing to cure this rude little boy was a good spanking that she didn't have the patience to sit through the long cure that Mrs. Piggle-Wiggle had in mind. I'm looking forward to continuing the book. I have a long list of books to read to her, but it has always been a future thing until now. Now I need to start dusting off that list.